If you’re the proud pet parent of a kitten, one of the most important decisions to make is what to feed your furry friend. Proper nutrition is very important to help kittens grow into healthy cats, and there are lots of great foods available which are specially formulated to support your kitten’s health. But with so many products to choose from, it can be difficult to know which is right for your kitten. We reviewed dozens of kitten foods to identify the best of the best, based on factors including quality, affordability, and feedback from Amazon users. We then narrowed our search down to 5 of the best kitten foods available today. Veterinarian recommended dry kitten food that’s specially formulated for indoor cats. We’ve identified Hill’s Science Diet Dry Kitten Food as the best kitten food available today. The specially formulated dry food is free from artificial colors, flavors, and preservatives. It also contains high-quality, nutritious ingredients to support your kitten’s overall health. Hill’s Science Diet Dry Kitten Food is a great choice for pet parents looking for a premium dry kitten food. The tasty chicken flavored food contains functional ingredients including fiber, vitamins, and antioxidants. The veterinarian recommended formula is also specially designed to provide optimum nutrition for indoor cats. 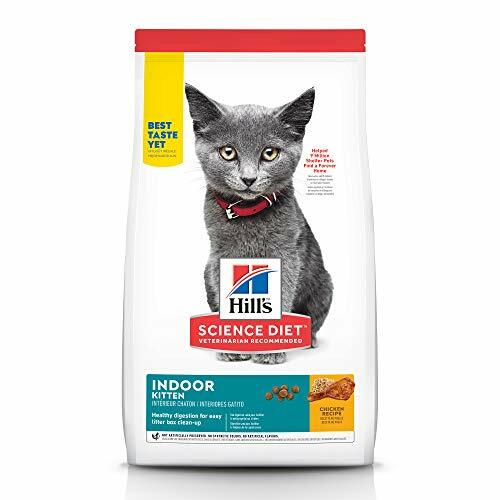 This popular kitten food from Hill’s Science Diet contains no artificial colors, flavors, or preservatives. It is also is backed by a 100% satisfaction guarantee. Many reviewers say the food is easily digestible and offers significant health benefits for kittens. Tasty canned kitten food with precisely balanced nutrition. 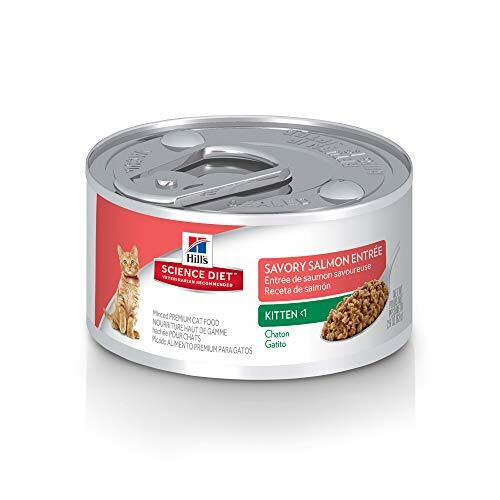 Hills Science Diet Wet Kitten Food is our runner up pick in the kitten food category. This high-quality wet food is available in a range of delicious flavors, and contains key nutrients and proteins to boost immunity and aid your cat’s development. The pate style food has a smooth, soft texture that’s easy for kittens to eat and digest. The nutrient-rich formula also ensures healthy growth and supports eye and brain health. Hill’s Science Diet Wet Kitten Food is also ideal for pregnant or nursing cats. Delicious canned kitten food with essential vitamins and minerals. Looking for a healthy kitten food that won’t break the bank? 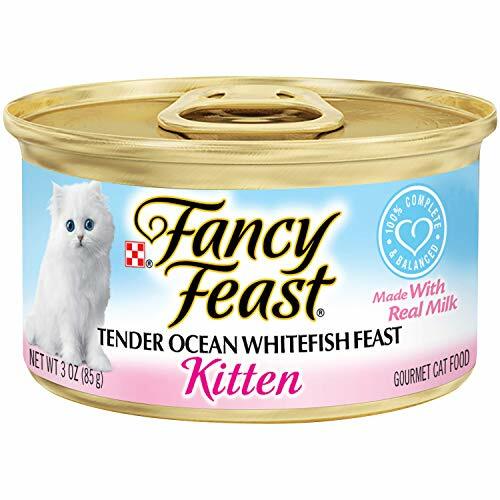 Purina Fancy Feast Kitten Canned Wet Cat Food is a delectable soft food made with real milk and wholesome natural proteins. The 100% nutritionally complete and balanced formula is designed to keep your kitten healthy, and the variety of tasty flavors are sure to be a hit with your feline friend. This kitten food comes in a convenient pack of 24 cans at a very affordable price point. Many reviewers are happy with the price and quality of the food. A natural dry cat food that contains quality protein and key nutrients. 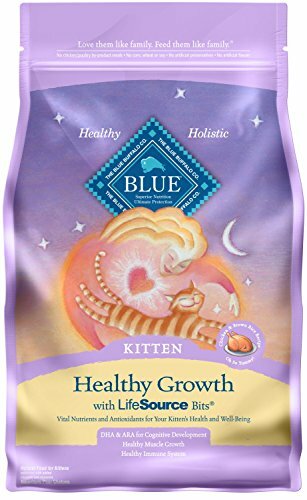 Blue Buffalo Healthy Growth Natural Kitten Dry Cat Food contains real meat as its primary ingredient. The healthy dry food is also packed full of eggs, whole grains, garden vegetables, and fruit for complete and balanced nutrition. This kitten food is enhanced with vitamins, minerals, fatty acids, and antioxidants. It is also free from artificial flavors or preservatives, and contains no corn, by-product meals, wheat, or soy. Overall, this dry food is an excellent choice for the healthy development of kittens. Tasty canned kitten food made with real poultry or fish. 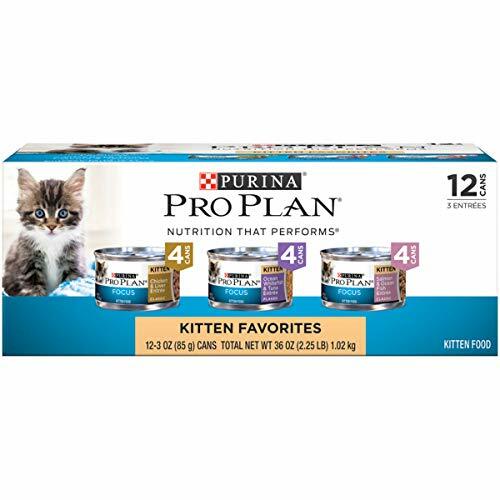 Purina Pro Plan Focus Kitten Canned Wet Cat Food is specially formulated for kittens throughout their first year of life. The tasty wet food is made with real poultry or fish, and contains added nutrients including DHA to support your kitten’s overall health. Reviewers say the soft, tender texture of this food is ideal for kittens, and the flavors are popular with even the fussiest of eaters. Unlike food for adult cats, kitten food is formulated to provide complete and balanced nutrition in the early stages of life. And since proper nutrition is the cornerstone of your kitten’s health, it’s essential to choose a diet that will support their growth and development. Make sure to do your research and select a high-quality food that will help your kitten grow into a healthy adult cat. We recommend speaking to your veterinarian if you need more advice on selecting an appropriate diet for your kitten. Ingredients and nutrients. A good kitten food should contain high-quality ingredients and adequate nutrients to support your pet’s development. Always read the label on kitten food to make sure you know what you’re buying. Most veterinarians recommend a diet that is high in protein and fat, with added nutrients such as fatty acids, vitamins, and minerals to support your kitten’s overall health. Please be aware that your cat’s dietary needs will change as they grow older. If you’d like to find out more about healthy foods for adult cats, check out our list of the best organic cat food. Dry vs. canned food. While dry food is convenient, canned food is much easier for kittens to chew and digest when they are very young. Ultimately, the most important thing to remember is to feed your kitten foods that are nutritionally balanced and complete. Flavor and texture. Cats can be notoriously picky eaters, and it may be necessary to experiment with different foods to find a flavor and texture profile your kitten enjoys. Thankfully, kitten food is available in a wide variety of flavors and textures, so you’re sure to find a brand your pet loves. Should I leave dry food out for my kitten? Yes. Dry kitten food can be left out for very young kittens to ensure they receive adequate nutrition. When kittens reach around 6 months of age they should transition to meal eating to prevent weight gain. How often should kittens be fed? As a general guideline, kittens should be fed 2-4 times a day. However, this can vary depending on factors such as the ratio of dry to canned food in their diet. Please ask your veterinarian for more advice on how often to feed your kitten. When should kittens start eating wet food? Most kittens can begin to eat solid food at around 4-8 weeks old. Wet food is a good choice as it is easy for kittens to chew and digest. Yes. Overfeeding a kitten can be very harmful to their health. Make sure to limit any food you leave out, and visit your veterinarian if you notice symptoms such as bloating or digestive problems. We looked at 20 other kitten foods. Even though they didn’t make our 5 best kitten foods, they’re the best of the rest and each is still is great option for your cat. The information you’ll need to compare each one is included with the listing. Premium wet cat food from IAMS with complete and balanced nutrition for healthy development. A 24-pack of natural, grain-free canned cat food with no artificial colors, flavors, or preservatives. This kitten food from Purina is designed to provide 100% complete and balanced nutrition to meet the needs of growing kittens. This ultra-soft mousse in sauce is designed to meet the needs of growing baby kittens and pregnant or nursing cats. A wet kitten food from Royal Canin that’s specially formulated for kittens up to 12 months old. Canned kitten food formulated with the optimal ratio of proteins, fats, and carbohydrates to meet the needs of growing kittens. A delicious grain-free canned kitten food made with quality proteins and added taurine for healthy eye and heart development. High-protein, grain-free dry kitten food from the popular Blue Buffalo brand. A new and improved dry kitten food recipe from Hill’s Science Diet that’s designed for kittens and pregnant or nursing cats. Protein-rich dry kitten food made with real chicken and healthy nutrients including vitamin E, DHA, and taurine. Most reviewers say this kitten food is palatable and made with high-quality ingredients. This dry kitten food from Nature’s Variety is made with real animal ingredients, nutritious oils, vegetables, fruits and other wholesome ingredients. This premium dry food for kittens up to 12 months old is made with farm-raised chicken and brown rice. It also contains essential nutrients including calcium and fatty acids. Premium, biologically appropriate cat and kitten food from Orijen that’s made with nutrient-dense whole prey. A dry kitten food from Purina that’s formulated to provide 100% complete and balanced nutrition for kittens. A crunchy dry kitten food made with high-quality ingredients including real chicken. Reviewers say this food is inexpensive and great for maintaining a cat’s weight. Chicken and rice formula dry kitten food with 41% protein to help meet a kitten’s unique nutritional needs. This dry kitten food from Royal Canin is formulated to support a kitten’s immune system development with an exclusive blend of antioxidants and vitamins. A dry food for spayed or neutered kittens that’s precisely formulated for kittens up to 12 months old after surgery. Delicious dry kitten food made with quality proteins including chicken and added taurine for healthy eye and heart development. A naturally grain-free dry food for kittens with chicken, turkey, cranberries, and added nutrients.